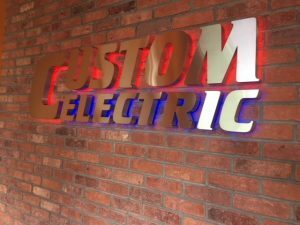 Custom Electric, Co., was started in 1982 by David Laraia. Edward Peterson joined the company a year later and became a 50% partner shortly thereafter. Custom Electric Co. incorporated in 1985 to become Custom Electric, Inc.
Our company has been located in Manchester, Connecticut for their entire 20+ years of business. We are currently located in a 7,000 square foot space at 52 Main Street, Manchester, CT. Custom Electric, Inc. has been involved in various industry venues over the years starting with housing, apartments, condominiums, and hotels. Heavy industrial has- and currently is- prominent in the mix due to the experience of the owners. Other areas of expertise include Commercial, Retail, Institutional, and Municipal. Custom Electric, Inc. has been involved in voice/data, fiberoptics, and OSP installations for the last 10 years, serving a variety of clients. We became affiliated with the IBEW Local 35 as a signatory contractor in January of 2002, due to the consistency, quality of training, and certification of the technicians available. In 2007, David Laraia retired from Custom Electric. In 2007, Custom Electric, Inc. became solely owned and operated by Edward T. Peterson.